David Littlefield of the University of West of England (UWE) has been investigating and constructing large-scale enclosures with Architecture, Architectural Technology and Interior Architecture students since 2012/13. Over time, the scope of these projects has become more ambitious, from desktop models to metre-cubed prototypes and, more recently, fully accessible geodesic and tensegrity structures. Mark Gower of the University for the the Creative Arts Farnham (UCA) had run similar structural projects with his Interior Architecture and Design students, but without focussing on specific structural types. What insights might be gained, they wondered, from sharing the same or similar design brief across the two institutions, which had similar programmes but significant differences in context? In the autumn of 2017, the project commenced; UWE students undertook their six-week project and were joined by UCA students at their final critique. David Littlefield’s cohort set up a Facebook page in order to capture and share their learning, which was made available to their UCA peers. Subsequently, in the spring of 2018, the UCA students tackled their own projects, in anticipation of UWE students and faculty joining for their final review. Students at both institutions needed to produce large-scale geodesic (UWE), gridshell (UCA), or tensegrity (UWE & UCA) structures that a) demonstrated an understanding of the structural principles at work, b) resulted in well-executed constructions, and c) enabled two people to enter and occupy the structures comfortably. To succeed, they would need to attend to aspects of making and planning that they had not fully utilised before, requiring considerable resourcefulness. This was not a “drawn” project, bar the need for templates, but offered students the opportunity to create a viable space through the application of a set of technical principles and a sympathy for materials. The briefs were similar, but not identical. UWE students worked in five groups of three or four, while the UCA cohort was divided into two groups of six. While the UWE structures were for internal use, UCA students were challenged to design and prototype structures for an exterior context. 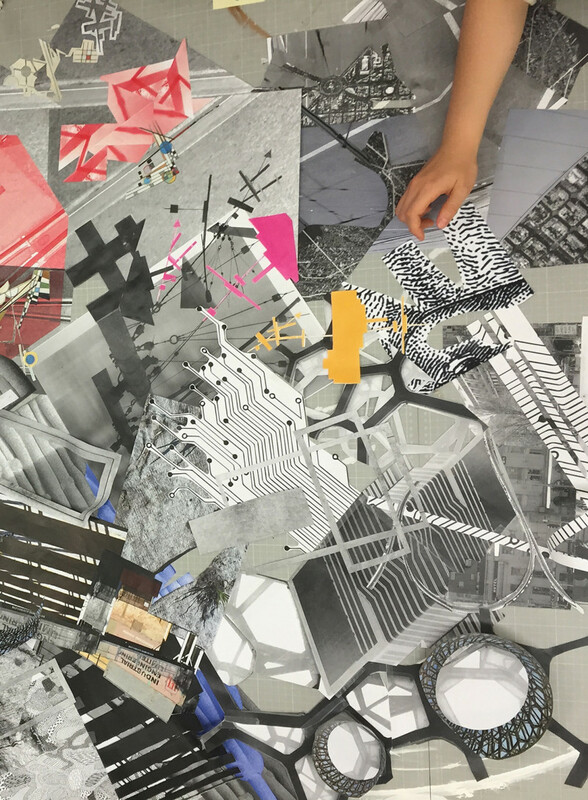 UWE students were able to engage in trial and error within the comfort of the design studio and workshops, while UCA needed to consider the vicissitudes of weather and exposure. Additionally, the UCA brief incorporated not just occupation, but use; the screen-printing and textiles departments at UCA served as clients, and the finished structures needed to be fully functional as exhibition spaces. When David and Mark conceived of this experiment, a kind of knowledge relay was envisioned, with the first group of students handing on their learning to another, instead of working in parallel in a spirit of competition or rivalry. The following two papers, taken together, examine the outcomes. David comments on the benefits of “learning by doing” and the role of the design review for the UWE students; Mark and his psychologist colleague Elaine Kasket explore how UCA students were able to find their “flow” through experiencing spaces not just as designers, but as users.